The Expedition 50 crew is getting ready to receive a shipment of space supplies Saturday after Russia launches the Progress 65 cargo craft Thursday morning. The final space delivery of the year will be Dec. 13 when the Kounotori HTV-6 resupply ship arrives four days after its launch from Tanegashima, Japan. Inside the International Space Station, Flight Engineer Peggy Whitson installed aerosol samplers to collect airborne particles for analysis on Earth. Scientists will study the samples using specialized techniques with powerful microscopes. Commander Shane Kimbrough is setting up science gear inside Japan’s Kibo lab module to study the fundamental physics of surface tension where liquid and gas meet. The experiment known as Marangoni Ultrasonic Velocity Profiler-2 may improve industrial processes and products on Earth and in space. New astronaut Thomas Pesquet, from the European Space Agency, strapped himself into the Muscle Atrophy Research and Exercise System chair for a study of his calf muscle and Achilles tendon. On Earth, that area carries loads from the entire human body. He conducted a series of ankle exercises while attached to sensors to monitor any changes in that area caused by living in space. What has been done to create gravity ? 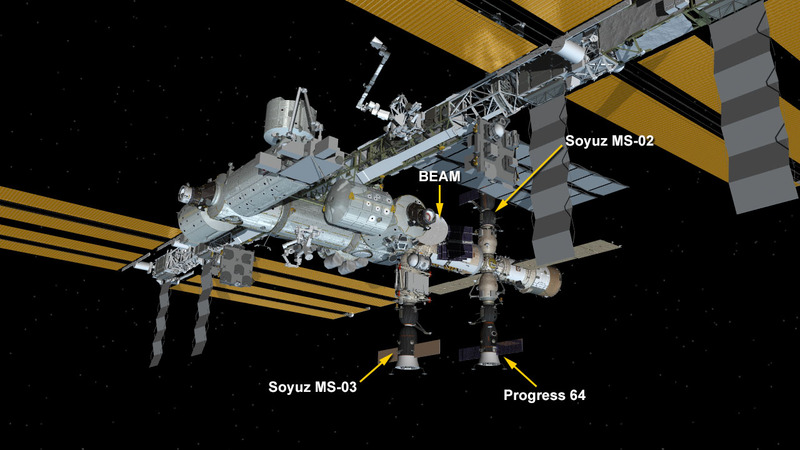 So muscle atrophy is no longer a concern .Maybe a change in shape of the space station . So as to allow a spinning wheel.. .centrifugal force , or some such thing might help . Looks like Nova nailed it! There are a big change in action up there. Things are working smooth!